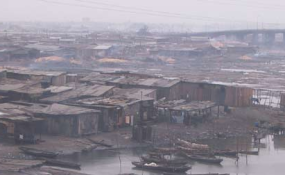 Ebute Meta in Lagos (file photo). The dark-grey clouds slunk low over the city, like streaks of charcoal smeared across the sky. For more than two years, residents of Port Harcourt, in Nigeria's south, have woken up nearly every day to this - a skyline dusted in soot, which often blots out the sun and coats cars, buildings, and streets in a fine layer of gritty black dust. But it isn't just the grime that bothers Briggs Bieye, a doctor at the government hospital at the Ignatius Ajuru University of Education. Nearly as soon as the soot began blanketing the city in 2016, he started to notice a sudden uptick in patients complaining of serious breathing problems. Given what he knew about the dangerous connections between air pollution and many of these conditions, Bieye found it hard to believe the timing could be a coincidence. And so, one morning this April, he slipped a protective paper mask over his nose and mouth and marched with thousands of others to Government House, the seat of the state administration here. The protesters carried signs reading "My life matters" and "Stop the soot". "Save our lives!" they chanted. "The soot is killing us!" A long-time social activist, over the past year, Bieye has become a central figure in a growing movement of doctors here, who have joined with local civil society activists to demand government officials do more to stop Port Harcourt's soot crisis. They argue that the poisonous clouds hanging over the city - thought to be caused mostly by the glut of legal and illegal oil refineries in the area - aren't just an environmental emergency. They are a health catastrophe too. Already, local doctors say they have seen an increase in acute respiratory infections among young children in the city, and fear even more significant long-term health consequences such as a rise in birth defects and certain cancers if the clouds don't clear. "I know my job is at risk, but I don't mind," Bieye says. For him, being a doctor has always been about advocating for the health of his community - whether that's by treating a patient, joining a strike against deplorable working conditions in hospitals, or answering health questions on popular radio programmes. Since his medical school days, when he was the secretary general of the student union, Bieye says he has always blended medicine and activism . "Joining the anti-soot campaign, therefore, was inevitable because keeping silent meant I was mortgaging not only my conscience but also the health of vulnerable children, women and the elderly." In 2016, state and local governments declared the soot an "emergency situation", but many activists say that, since then, there has been little concrete action. So the city's doctors took matters into their own hands. On a recent day here, Uyobong Uko stood in front of a group of school children to give a presentation on how to protect themselves from soot - something he does about once a week as a form of personal activism. As he spoke, he knelt down and pressed his palm against the ground. "This is what you are inhaling," he told the kids as he rubbed the crusty dirt into his hands. "This is going straight into your lungs." Uko, a scientist and veterinary surgeon, says his intention isn't to scare anyone but to make people safer. "They need to begin to wear nose masks, support their parents to clean the windows and close the doors when they are in the house," he says. "They need to play less outdoors and play more indoors, cover themselves properly, wash their hands with soap and water as often as possible, wash their playthings. That is what we are doing from now henceforth." Like many doctors here, Uko is particularly worried about the impact soot could have on the city's children. Already, there is some evidence of the particular risks they face. According to a study from the community health department at the University of Port Harcourt Teaching Hospital, the prevalence of acute respiratory infections (ARI) among children under five jumped nearly 50% between 2015 and 2016. The study hasn't been published yet, but it is the only research that has been done in the area. "The later period coincides with the emergence of black soot in Port Harcourt. This may account for an increase in [the] number of ARI cases among under-five children," writes paediatrician Agnes Fienemika, who conducted the study of about 11 000 children at the state-owned Braithwaite Memorial Specialist Hospital between September 2015 and December 2016. Lower respiratory infections such as bronchitis and bronchiolitis accounted for almost one in every five deaths among children under five, according to 2015 World Health Organisation (WHO) statistics. The body estimates that poor air quality causes more than a half a million deaths from respiratory infections annually. Fienemika was moved to conduct her study, she says in the research document, because she knew that, if activists wanted to prove to government that soot was dangerous, they needed hard evidence on their side. "[We] can't be silent, we have to be proactive, we have to act," she writes. "What I want ... is for us to be proactive because [soot] is everybody's problem." But even as doctors here have waged educational campaigns and conducted research to show the health dangers of soot, they have also found themselves on the front lines of a broader protest movement to demand government accountability for the soot crisis. Soot, as Bieye often explains on radio shows and to government officials, can be a stealthy killer. "As a doctor, I see cases of upper respiratory tract infection, I see cases of bronchial asthma, cases of pulmonary diseases, and you say I should keep quiet?" he says. The sticky black dust is made up of tiny particles of charred acids, chemicals, metals, soils and dust. It is created in the burning of fossil fuels and other noxious materials. Each individual fleck of soot is just a thirtieth of the diameter of a single human hair, which allows it to enter into people's lungs easily and deeply when they breathe in dirty air. From there the particles can slip into the bloodstream, and are linked to a long list of dangerous breathing ailments, including respiratory and cardiovascular diseases and asthma, according to research published in The Lancet medical journal in 1995. Globally, outdoor environmental pollution - to which soot is a major contributor - killed more than 4.2-million in 2016, according to a 2018 WHO fact sheet. About 90% of these deaths occur in low- and middle-income countries such as Nigeria. Nearly every person in Nigeria, 94% of the population is exposed to levels of soot that exceed WHO guidelines, the World Bank's Little Green Data Book 2015 shows. Globally, the rest of the world is not far off - almost nine out of 10 people on the planet breathe air that doesn't meet WHO standards. And industrial cities such as Port Harcourt are at particular risk. For decades, this bustling city has been the epicentre of Nigeria's massive petroleum industry. Flanked by both legal and illegal oil refineries, belches of black smoke on the horizon have long been a regular feature of life here. But in recent years, as Nigeria's government has cracked down on illegal oil refiners, it has burned many of their operations to the ground, coughing even more soot into the air. Many activists and academics suspect this is why a perpetual blanket of soot now hangs over the city. "We all point to sources starting from the refineries [that] are visibly polluting," says Nnimmo Bassey, director of the Health of Mother Earth Foundation, a local environmental think-tank. "We are [also] seeing the way the military burn those [illegal] facilities." That, in turn, has sent levels of air pollution soaring. The levels of air pollution "for Port Harcourt are way off the [safety] chart", said Rabia Said, a physicist at Bayero University in northern Nigeria who studies the soot crisis in Port Harcourt, at a public forum on the issue in 2017. This smog isn't just clogging the city's lungs, it could also be fuelling increases in cancer risk. Soot as well as petroleum coke - a substance produced by oil refineries - are both on a list of 36 substances found in the air that the International Agency for Research on Cancer had said either cause cancer or are likely to. Over the past three months, there have been several large protests in the city. Doctors have been among both the organisers and the participants, wearing T-shirts reading #STOPTHESOOT as they marched through the smoggy streets. For many doctors, this was a familiar position to be in. For years, the healthcare sector has been the site of repeated strikes for better wages and working conditions and, paediatrician Fienemika notes, many doctors are intimately familiar with using protests to hold their government to account. "So many of us are putting our lives, our careers and everything we have worked for on the line to ensure that the people of Rivers State and their environs get good health," says Uko, the veterinarian. And at least on some levels, their activism seems to be working. The Rivers State government is now suing the central government for its silence and violation of citizens' right to a clean environment. And Nigeria's Parliament has also ordered an environmental audit into the crisis. But in Port Harcourt, these initial victories have not dulled the fight for local doctors. At the recent protest attended by Bieye, the government hospital doctor and the deputy governor, Ipalibo Banigo, eventually emerged from Government House to address the demonstrators. They were directing their anger to the wrong people, she explained. They needed to make their complaint to the national government in Abuja, not to her. But before she could finish, her voice was drowned out by a rising chant. "We will not stop until you stop the soot!" - Additional reporting by Ryan Lenora Brown and Adri Kotze.